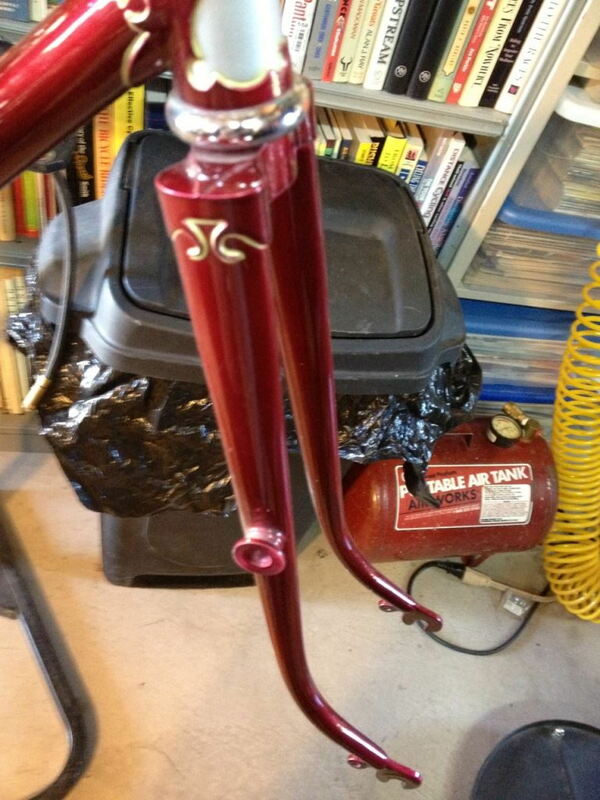 Did you repaint the frame? No. I've just taken pictures in favorable lighting. Seriously, this bike has a lot of patina. I'm thinking about having it completely refinished with new chrome and paint, keeping it black. Mostly this is motivated by a big patch of lost chrome on one of the chain stays and the missing chrome band on the seat tube. 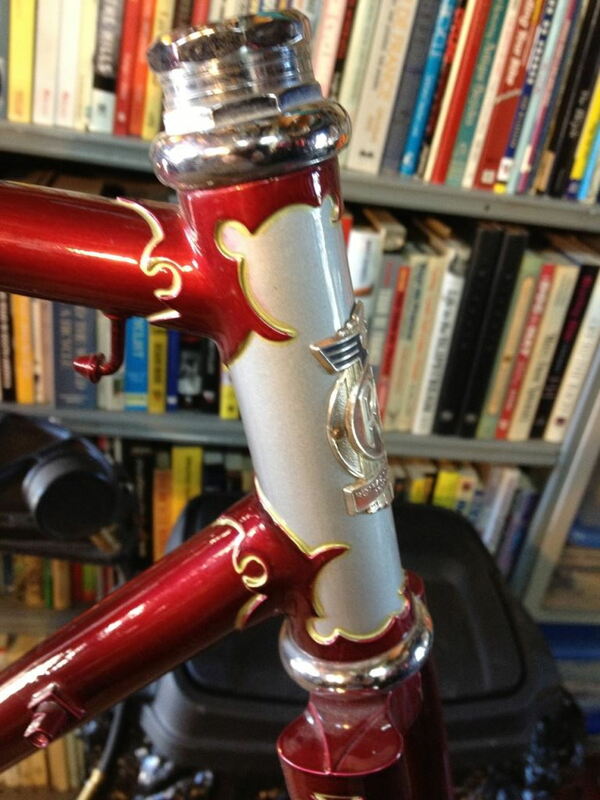 Also, this bike would be drop dead gorgeous with good chrome and paint. I have some serious Raleigh Competition envy going on over here. However, I also have what might be a really good tape suggestion. It's Brooks Microfiber, color Honey, 22 bucks at Amazon. Pictured on another black Raleigh here. Looks like a solid match for your saddle. And oh by the way... SWEET bike. Looks good. Chrome Nervex Pros and gloss black paint--seductive as always Highway One's are a nice upgrade and still work form-wise. Matching browns is pretty much witchcraft as far as I'm concerned. Thankfully we have many a catalog, from low-end to high-end offerings, that display color-mismatched saddle and bars. I Photoshopp'ed up some bar tap colors. Standard black, the oft-paired white, and red (which seemed to come on some bikes colored like this). LOL at the white walls comment--wasn't even a consideration! They're heavy tires--gotta keep the rotating weight down! The white bar tape does look fetching, though. Last edited by Freqman1; 12-06-18 at 06:28 PM. And best of all, the bike is parked at a great stop for eats! Yeah, I first spotted it about a month ago and had actually been trying to talk myself out of it. I have a '74 International which I thought was basically the same bike as this. It disappeared for a while and so I thought someone else had bought it. Then Thursday night I sold a bike, which of course meant I needed to look at CL for something to fill the hook in my garage. 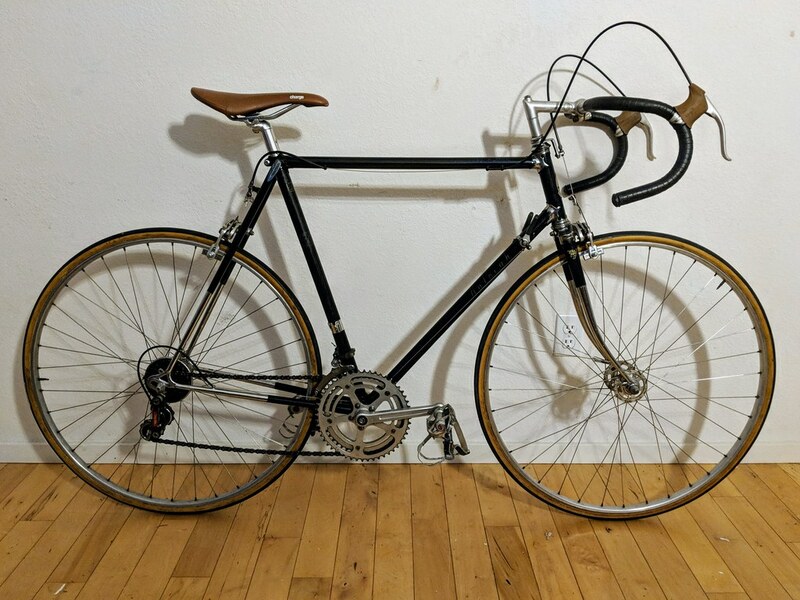 Even after seeing that it was back I tried to talk a friend who's looking for a bike for Eroica into buying it, but he thought it was too big. It's surely the biggest bike that would fit me and really only works because of Raleigh's insistence on using 57cm top tubes for everything. Here's a pic I took with a test fitted saddle set to the height I need. I think I might need a honey Brooks for this one. Standover...I'll need to remember to wear shoes with some tread. Reach...I'll need a shorter stem, but otherwise it's about the same as most of my 57s. Apart from the tube angles (which are slacker on this bike), this is the same size as my International, so I knew it would work for me. The tire clearance on this bike is outstanding. Gugie and I test fitted it with 650x42s and they fit with room to spare. Last night I tried out some 27x1-1/4" tires and they fit with a good five millimeters to spare on each side. If I dimpled the chain stays I think I could use 700x42s. The stem - don't stay true! Get one without the sternum bolt. (That bolt.) I met mine in 9th grade on my UO-8. Took me several years to get it off, but once it was off, it and similar were/are never going on any bike I will ever own. Thanks for that suggestion. The online picture does look pretty close. On the other hand, almost matching is sometimes worse than not matching at all. Salsa makes a brown tape that I thought was going to be good, but I looked at it in the shop when I bought the saddle and it was too dark. I thought about getting it and just waiting for the saddle to get darker. I Photoshopp'ed up some bar tap colors. Standard black, the oft-paired white, and red (which seemed to come on some bikes colored like this). Thank you so much!! That's awesome! The white definitely looks the best of the three of those, and maybe even suggests that dirty white tape would look nice. The black kind of reinforces my suspicion that even if I matched the bar tape to the saddle the mismatched gum hoods would look odd. I feel like it needs something else white on the bike though. 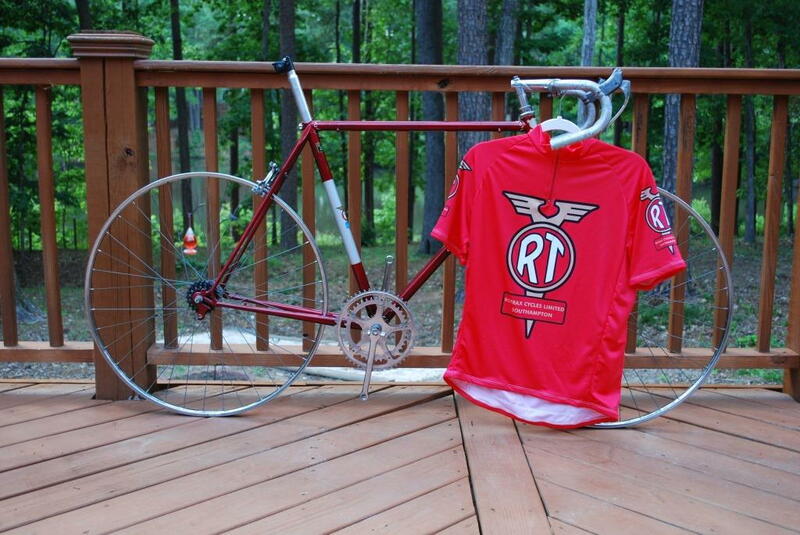 I wonder how the script Raleigh decals would look in white. The white definitely looks the best of the three of those. I actually like the red best by a huge margin.. Interesting. I usually like red and black, but in this case I felt like the red clashed too much with the brown saddle. That is a very sweet looking bike. I struggled with this bar tape color question and my ever-darkening “natural” GB saddle. If the decals are white, then white tape seems good. The Fiz’ik Classic Touch white on the Marinoni has stayed white for over a year with no special effort, and was a good choice with the GB saddle, but white housings throughout. And maybe black rather than gum hoods? I like that idea, too. Andy, you kids have it so easy. To get a bike my age, I have to go back to the 50s. 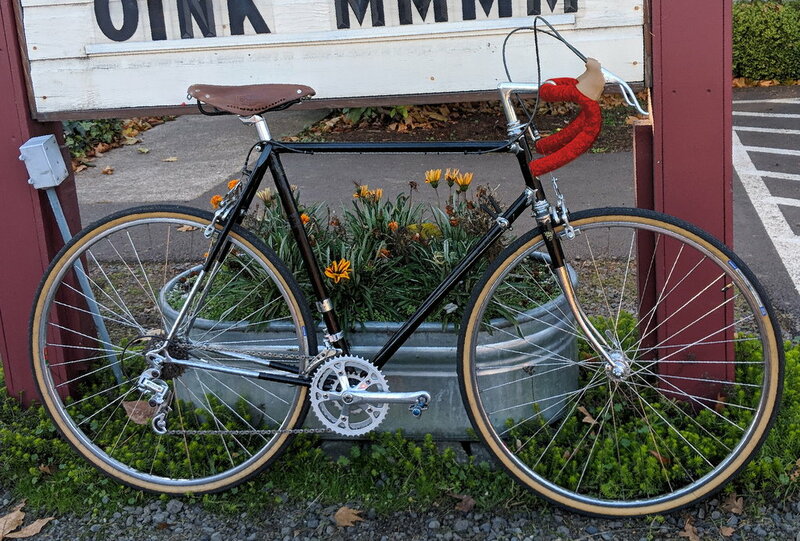 If getting parts for my bikes made in the 70s is a challenge, difficutly factor for something 20 years older than that is going to be an undertaking. Bring it on! Big deal. If I get a bike that is my age, it will have to be a 1939. I do ride a bike that is older than me, my 1924 Mead Ranger. And I ride my Follis occasionally with a plastic Simplex derailleur. Actually, I have a bike that could be a 1938 or 39, our Colson tandem, though we haven't ridden it which is a long and sad tale. That's very young bike and man,, heheehe.. I would need to find a 1961 made towards the end of the year to have a same age bike.. 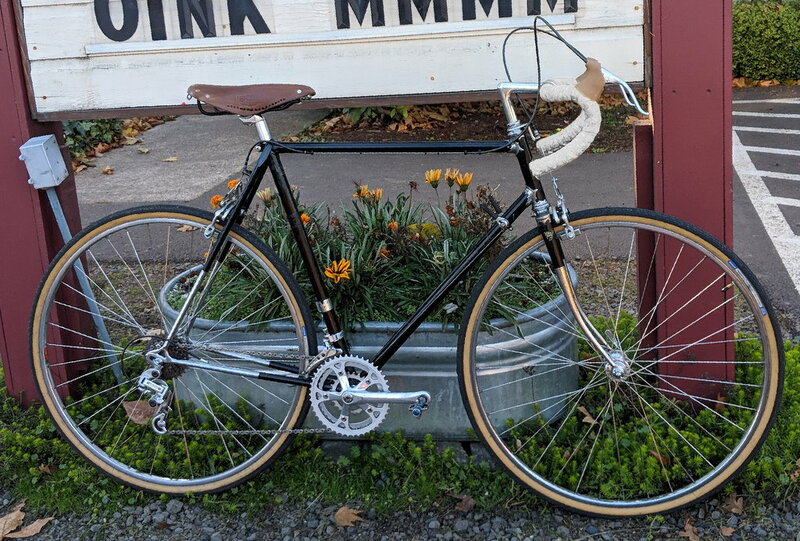 I will get a 1964 something at some point, but in the meantime there's my recently acquired Guerciotti. The company started in 1964 so that will do for the moment.